A PARADE LIKE NO ONE HAS EVER SEEN BEFORE IN MONTRÉAL! 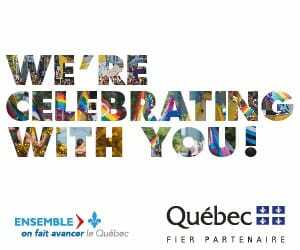 This 36th Pride Parade, Montréal’s largest parade, will be held on Sunday, August 18. Inspiration for the theme of the parade will, for a fifth year, be the rainbow flag and will highlight the color violet, which evokes dreams, gentleness and peace. We invite all parade participants to wear this color and interpret its meaning in an original way! The 2.7 km parade’s route will symbolically link the old and the new as it departs from the former west end LGBTQ+ sector to arrive at the very heart of the new Village. Following its traditional route along René-Lévesque boulevard, the parade will begin at Metcalfe Street, to end on Alexandre-DeSève Street. Be ready to take in the intense festive ambiance of the parade featuring all kinds of colorful people, themed floats, dancers and musicians along with the marching representatives of our diverse LGBTQ+ communities. Come support and greet our elected officials, the members of many community groups and of the First Nations as well as businesses and other organizations marching in solidarity with us! Two sections have been reserved for the use of persons with reduced mobility at the corner of René-Lévesque boulevard and Phillips Square street. Montréal Pride recommends you use public transit to come to the parade.